I didn’t grow up with guns in the house because my family didn’t live in the continental United States. Due to my Dad’s job, we were all over the globe and living in places that didn’t exactly have Second Amendment rights. However, during my high school years, two of my older buddies were finally of age and could legally go through the process to purchase firearms. We started target shooting. Not advanced shooting classes, but just shooting for fun. Living near the ocean, we would sometimes go out to remote places where we could shoot into the water. We’d throw empty gallon milk jugs into the water and then do our best to shoot at them while they were bobbing on the waves. This, by the way, wasn’t exactly legal! (Since then, the legal aspects of self-defense have been hammered home by other instructors as well as in this exceptional book.) At other times, we went out into the boonies and shoot at anything we could: soda cans, bowling pins, and even lizards. Those were not easy to hit! They were skinny and constantly moving! During this time, I didn’t have any formal training. I just went shooting for the pure fun of it and the personal challenge of getting better each time. That changed during my college years, though, when I was allowed, as a civilian, to participate in a semester-long police firearms training academy. The other civilian was my lizard-shooting buddy, Paul. It was during this semester that I learned, in a more formal setting, the fundamentals of shooting, and how to effectively shoot shotguns and pistols. This was probably the best firearms education a person could ever have. Our group went out every single Saturday for four straight months. We spent 8 hours on the range, getting about an hour of instruction and then 6-7 hours of shooting drills. I don’t think I even ate lunch on those days! I would be starving on the drive home. Our 2 instructors were Mr. Hill, with a background in the prison systems and the main firearms instructor for this shooting academy, and Mr. Dennis, a former police/narcotics officer. Mr. Hill was a behemoth of a man and very effective with a shotgun, in particular. Both these instructors lived to shoot — maybe they were married and had families, but guns and shooting seemed to be their first loves. They were determined that not a single student would leave the class without being highly competent in shooting skills and comfortable with their “use of force” decisions. The muscle memory developed from dozens and dozens of hours of (mostly) handgun shooting remains with me and is ingrained in my body, even after all these years. Techniques I learned to improve my accuracy are still effective, and I’ve taught them to my wife and kids. I feel very, very comfortable with a firearm in my hands, but it wasn’t until I took another class many years later that I was challenged on a whole other level. This time it was, again, my buddy Paul who invited me to join him in an all-day class on a military base where he worked. The invite was irresistible. I would be spending the day with a group of Air Force combat personnel who were preparing to be deployed and were required to take this class in urban warfare. Naturally, I jumped at the chance, and nobody questioned my presence or credentials. I kept my mouth shut — definitely a don’t ask, don’t tell situation! For the first time in my life, I was in a scenario in which live fire was being used and I wasn’t exactly behind the firing line. There was no firing line! We performed exercises in which we were constantly moving and engaging targets, tactical reloading while moving, maintaining communications with team members, and doing all of this under non-stop pressure by the instructors who were screaming and cussing and deriding us. One guy’s gun jammed and the diatribe by the instructor was merciless and, I have to admit, very funny at the time. Initially, I had the jitters because this was very exciting to me and the setting unfamiliar. I had always wanted to be in a scenario like this — but without being a target by a real criminal with a real gun! Been there, done that. After a few minutes, my mind and body became accustomed to the adrenaline and excitement. My nerves calmed, my breathing slowed down and became more regulated, and I was able to make the quick decisions and reactions being demanded of me. By the end of that day, even though I had been shooting for years and had received so much instruction and practice, I knew my shooting expertise had reached a new dimension. Without the many years of casual and formal practice and instruction, there’s no way I would have been ready for such an intense training experience. A few of the Air Force guys in the group left that day realizing they needed more practice. When I think about the low training requirements of nearly all law enforcement officers — this is what they actually need, each and every year as our cities and streets become more dangerous and hostile to police officers, in particular. 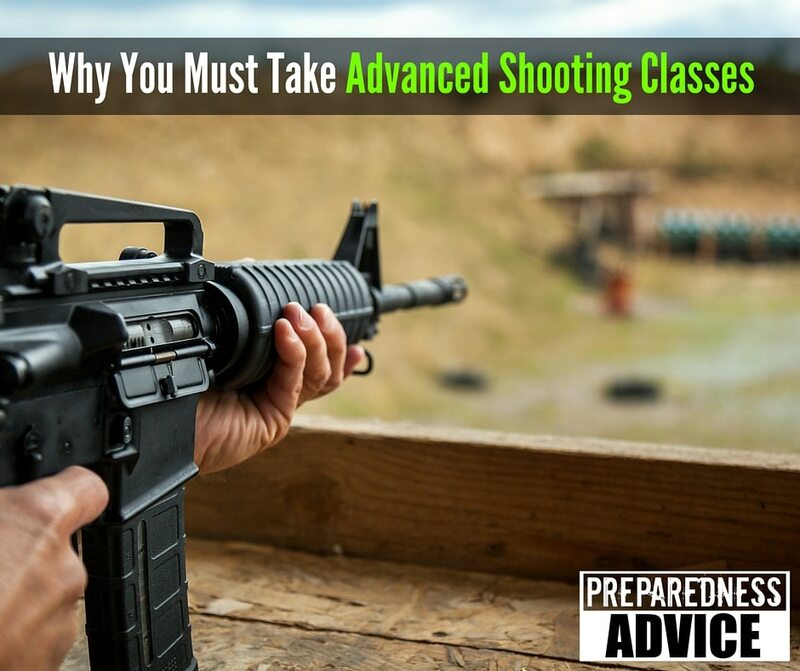 So, why must you take advanced shooting classes? In a real life situation in which self-defense is necessary, you need enough practice hours behind you so that muscle memory is there each and every time you pick up that gun. You won’t be standing behind a line with your pistol on a bench and with a motionless paper target. You need to spend hours under some kind of pressure, so you become comfortable with all aspects of shooting. You’ll have to make lightning quick, on the spot decisions. Everything about shooting, from stance to grip to aim should all be so familiar that the only decision to make is whether or not to pull the trigger. In my case, my upbringing and where I lived in the world was a little different. I happened to be at the right place and, apparently, had a connection or two that allowed some unique experiences to come my way. However, a good shooting range will offer advanced classes, and I encourage you to take as many as possible. When you find a good instructor, take every class he or she offers. Classes you might consider are concealed carry classes (if allowed in your state), defensive handgun, defensive shotgun, and tactical firearm classes. Courses that integrate mindset, marksmanship, and individual/team tactics under realistic conditions will not fail you. Prepare to be challenged in every way possible. Your physical endurance will be tested. You’ll learn a lot about yourself and how you react under extreme duress — something that most people never experience in their entire lives. One more tip: be sure to get a good night’s rest the night before. You’ll need it. Disclaimer: Know your local, state, and applicable federal laws. Shooting at lizards may not be legal where you live and I don’t recommend it anyway! This entry was posted in security, self defense and tagged firearm, handgun, NRA, pistol, rifle, training. Bookmark the permalink.